The train involved in Friday's train crash in Cumbria is a Pendolino tilting train - capable of running at up to 125mph (200km/h) on the West Coast Main Line. Travelling between London and Glasgow, the £11m trains cover the route in around four-and-a-half hours. 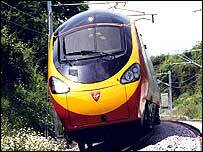 Built in Birmingham, they were first introduced by Virgin in July 2002. The firm now operates more than 50 Pendolinos. The trains had a top speed of 110mph (177km/h) until December 2005, when an upgrade of the West Coast Main Line was completed. That upgrade involved re-laying about 1,000 miles (1,610km) of track along the route. Last year Virgin unveiled plans to boost the speed of the Pendolinos from 125mph to 135mph (220km/h) on some sections. Pendolino trains have a tilting mechanism that allows them to go faster around corners and travel more comfortably for passengers. An on-board computer system stops the trains tilting if they are going too fast - ensuring they do not exceed the speed limit on the line. At the section where the incident happened, the limit was 95mph (150km/h). Rail expert Christian Wolmar said Virgin had a good rail safety record. In-built safety features included crumple zones at the front of the trains, safety exits and ladders, he said. "They have a very high standard of resistance to accidents but one has to recognise that they go very fast and that nothing can prevent some damage happening when accidents happen at that speed," he added. Maureen Kavanagh, from the Safety on Trains Action Group, said the Pendolino train in the Cumbria crash had saved a lot of lives and injuries. She founded the group after her son Peter died in the Southall train crash in 1997. "The carriages remained intact, and none of the windows broke because when I saw that they'd actually gone down the embankment, I thought that many people would be thrown through the windows," she said. "And the fact is the actual passengers were contained within the train and that probably saved a lot of lives. And that's just because it was a state of the art train." BBC transport correspondent Tom Symonds said the trains carried a sophisticated data recorder which should give information about the crashed train's speed and the actions of the driver. Passenger numbers on the West Coast line rose from 15.4 million in 1998-99 to 18.7 million in 2005-06. Until the Cumbria crash there had been only minor incidents involving the Pendolino train. These included two incidents at Liverpool Lime Street Station where the train hit buffers at the platform.